How do you use glass in the interior? In window frames or cabinets with transparent shelves? 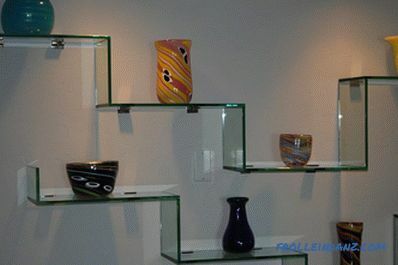 And remember how many beautiful decorative glass products make modern masters: wine glasses, figurines, vases, dishes. 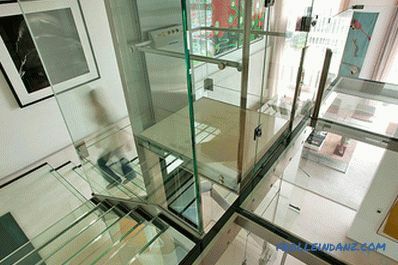 In addition, in modern public and private interiors, designers boldly use glass partitions instead of walls, replace concrete floors with transparent ones, build weightless stairs made of durable thick glass. In the modern concept of glass - it is not just a transparent fragile material. It can be hardened, impact resistant, matte, patterned, colored and carved. It is made in the form of large flat panels, bend, stretch and give any desired shape by heating. 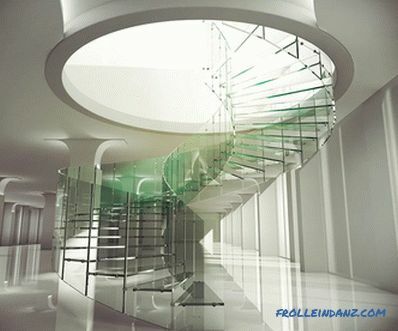 Colored glass in the interior, as well as transparent, can have not only decorative, but also practical value. 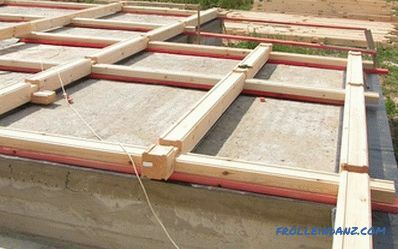 It is used in the manufacture of furniture, chandeliers, glass partitions. Transparent, fragile-looking objects make the interior refined, filled with air, create comfort. From the moment the process engineers learned how to create large, but at the same time strong glass sheets, it was not so much time. 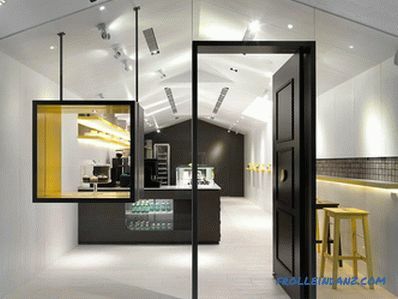 But overall glass constructions have already firmly entered the design of modern offices, cafes, apartments. To divide the space, using the natural light of the room as much as possible, designers are increasingly using frosted glass in the interior. For example, make partitions of glass, half transparent, half opaque. This maintains the confidentiality of the work or personal space. 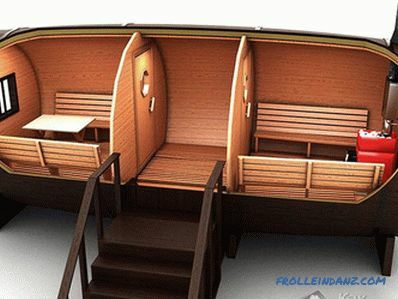 At the same time, the maximum amount of light enters it from the windows. 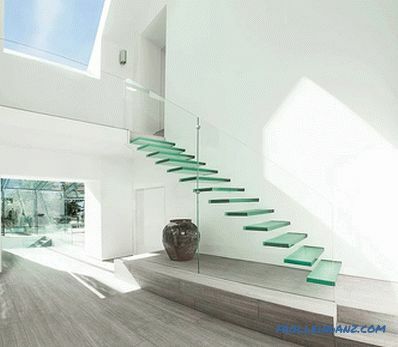 In addition to partitions, doors with transparent inserts, glass floors and even staircases are in vogue today. Of course, such facilities may scare people suffering from acrophobia (fear of heights). But in general, they create a unique design and fill the room with space. To emphasize the individuality of the room, you can use decorative glass in the interior: colored, patterned, frosted, stained glass, sandblasted matte and artistic carving . The doors of this material completely change the appearance of the room. 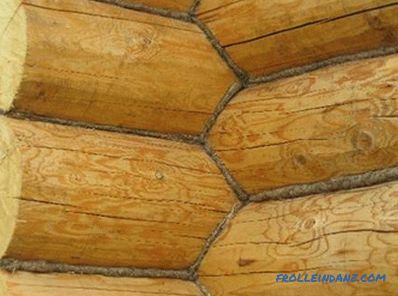 However, they withstand the load, have soundproofing and decorative properties not worse than wood. # 4 metal structures with stained glass inserts. Transparent Partitions are in demand when zoning office space. This idea was first used by American designers. They cleaned the walls on the entire production floor, leaving only the supporting elements. We used the light from the wall, equipped with windows, to illuminate the entire office space without interrupting it with a dense partition, but by dividing it with transparent glass structures. Thus, each employee received a personal workspace, but still felt like part of a single team. 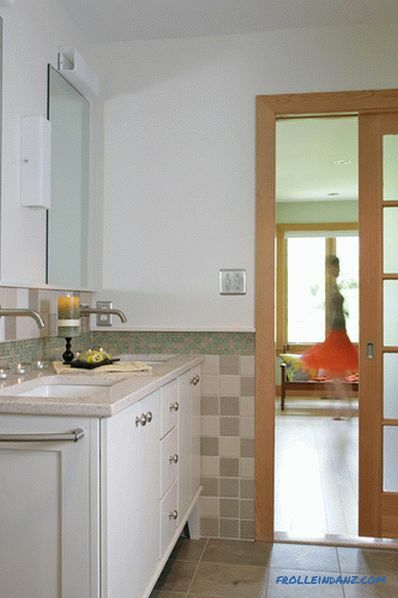 In a small apartment, glass partitions will help to preserve the feeling of spaciousness in the rooms. When redeveloping an apartment in a studio apartment, extra walls are demolished, uniting the square. 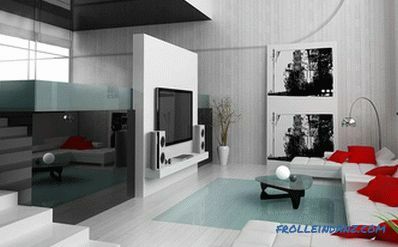 If necessary, separate the kitchen or living area using glass in the interior. 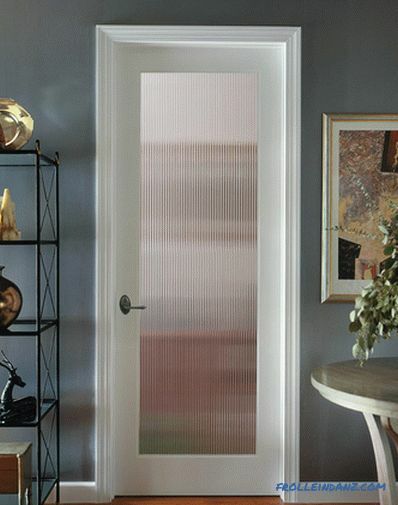 If you need to protect your personal space - a bedroom or a shower room - use a frosted or tinted version. 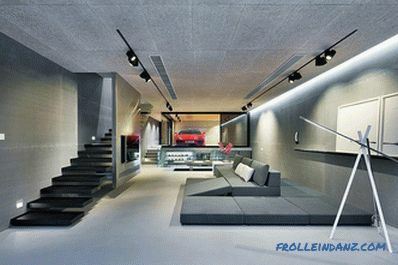 Even with the use of such an option, light penetrates the room, and the feeling of freedom and a single area remains. 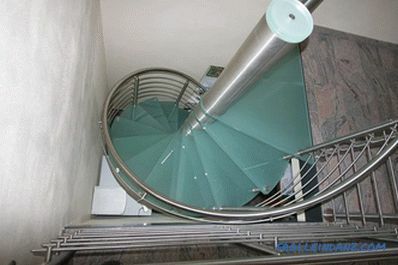 Immediately you should make a reservation that for the manufacture of stairs They use not ordinary thin glass 3 mm thick, but solid triplex. This is a special three-layer glass with a layer of polymer film. 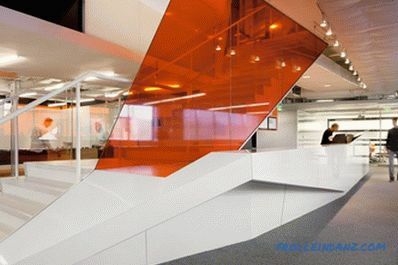 the metal frame is filled with opaque steps and protective panels. Note : Opaque white, black or other glass is more tangible than transparent, and looks more secure. 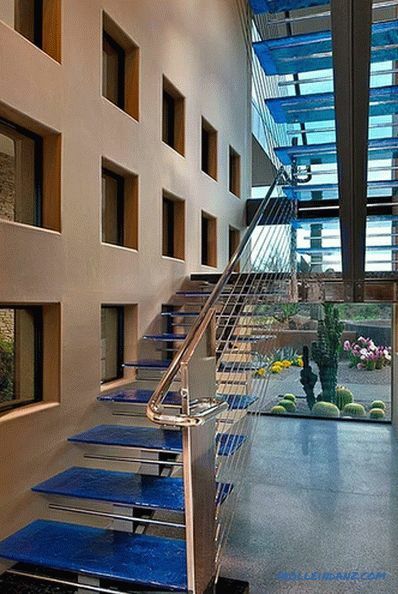 The most exotic way to use glass in the interior is to make a floor covering out of it.It is best to use such a transparent floor in a multi-storey building, where from the height of the 4th floor you can clearly see what is happening on the ground floor. 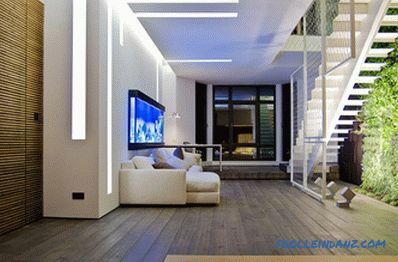 In fact, such an idea is already embodied by designers in bold projects of the interior of apartments in the style of minimalism, high-tech or fusion. 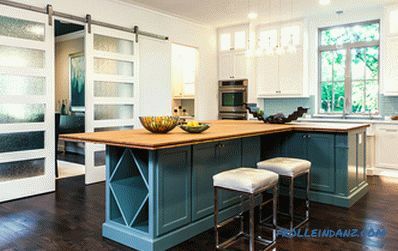 An important condition for transparent floors is that they are made in the common area, for example, between the living room and the hallway or the lounge and the living room. Guests will appreciate and will long remember how to "soar" above the first floor of the house. In addition to our usual furniture - coffee tables with a transparent table top, shelves in a showcase with dishes - make unusual glass chairs (colored and transparent), cabinets. 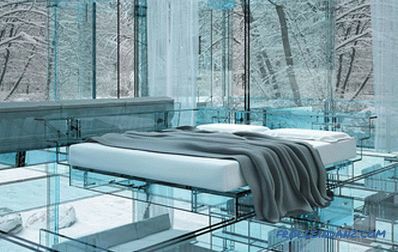 The most unusual example would be a glass designer bed. This is one of the sought-after and long-popular pieces of furniture. Tables make coffee, tea, dining, round and square, completely glass or only with a transparent table top. They are presentable in appearance, environmentally friendly, have a strong decorative function. However, they require careful proper care with the help of cleaning products and a soft cloth. After all, on the glass can remain fingerprints, food, drinks. If there are small children in the house, you should not choose an unstable table on the central support. During the game, the child can catch and overturn him. 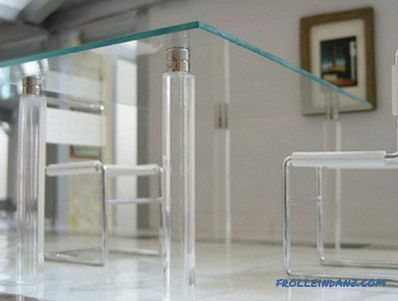 In this case, a solid four-legged wooden table with a transparent tabletop is more suitable. 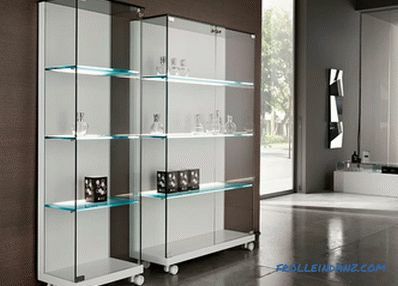 Fully glass cabinets with transparent shelves are called display cases. They are used in trade, museum and exhibition business. Also they can decorate and home interior. 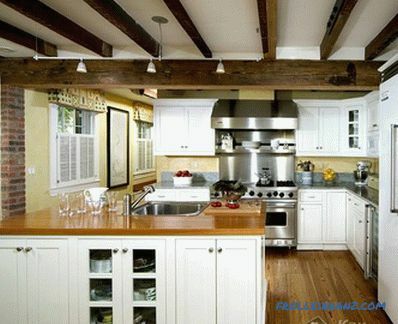 More familiar are the glass shelves in wooden cabinets, or the outer shelves on the wall. They are used to demonstrate glasses, beautiful dishes, figurines, decor or books. For a more decorative effect, such shelves are illuminated with a diode tape. 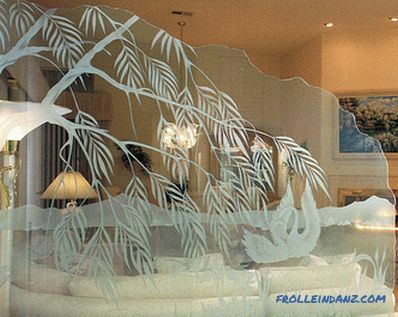 A skilled designer uses frosted glass in the interior as skillfully as usual or color. He uses it as a creative tool to help realize the most non-trivial ideas. At the same time, it can be used in many interior styles: classics, hi-tech, minimalism, eclecticism and others. 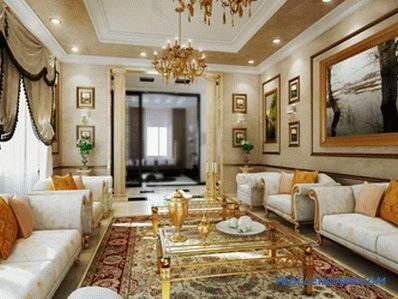 Filling a good classic interior with glass structures and details, the designer makes it easier, more elegant. At the same time, glass table tops only adorn massive tables with carved legs, and luxurious crystal chandeliers create a festive atmosphere. 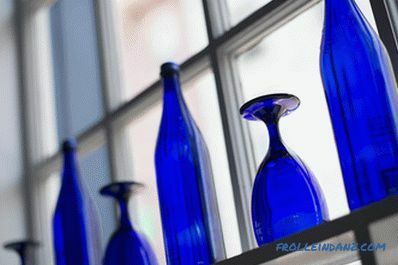 For this style, glass is just like stone or wood, as it is a completely eco-friendly material. In fact, the glass contains natural components, it does not emit harmful compounds, is recyclable, and is perfectly adjacent to stone or wooden products. Glass and chrome-plated metal are fundamental elements of the style. 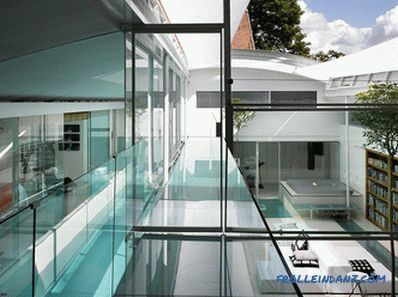 Glass in it is used everywhere - as kitchen panels, zoning partitions, furniture, decor, doors. Colorful glass in the interior of an apartment in the style of minimalism helps to place accents properly, to divide the area without overloading the space . Mixed styles or their elements fill the eclectic interior. 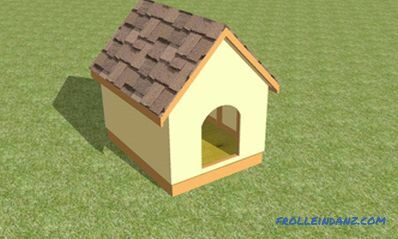 Often, modern apartments of citizens are made in this style. 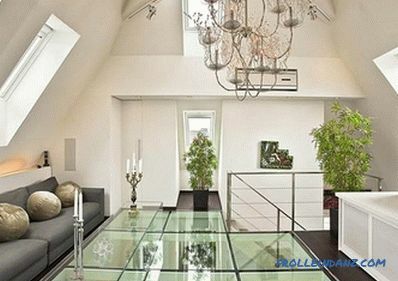 Here glass is used for furnishing, lighting, dividing and decorating rooms.